Our dream for 440 Turk Street is for it to be the front door to the Department and a place where people experiencing homelessness can get some much needed respite from the streets. 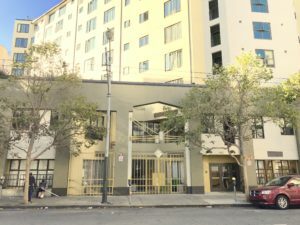 We envision a safe and welcoming space at 440 Turk where people will be able to begin their journey out of homelessness, connect with our shelter and housing resources, take a shower, and do their laundry. On site staff will provide vital services like case management, benefit enrollment, problem solving and access to programs like Homeward Bound. Additionally we hope to locate a small medical clinic on site to make this a place that will truly meet the needs of people experiencing homelessness. By activating this vacant space HSH will have a positive impact on the block and the neighborhood. HSH staff and partners will help bring improvements to the whole block while contributing to the neighborhood economy and be a good neighbor to the housed and unhoused residents of the Tenderloin. Join us on August 3rd to learn more about our vision and share your thoughts.